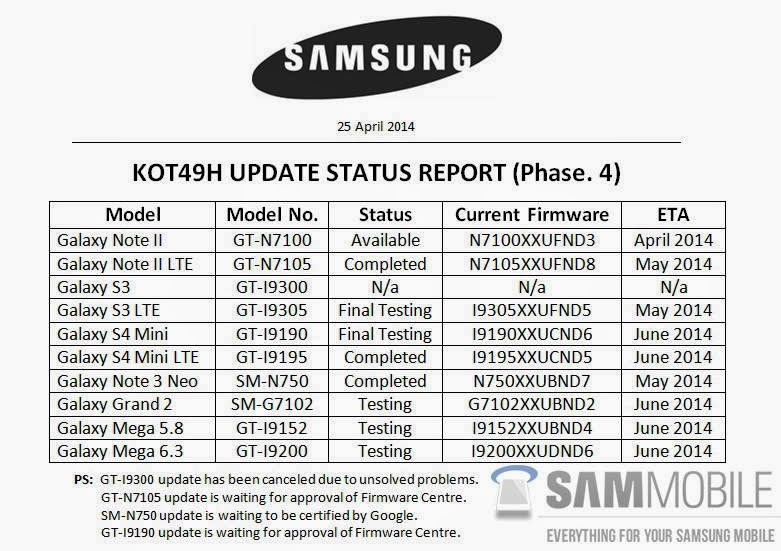 Eight Samsung devices are expected to receive the much anticipated Android 4.4 KitKat update in May and June. This is according to the purported leaked internal document, which Sam Mobile verified to be legitimate. Among the devices to get the update are Galaxy Note 2 LTE, Galaxy S3 LTE, Galaxy S4 mini and mini LTE, Galaxy Note 3 Neo, Galaxy Grand 2 and Galaxy Mega 5.8 and 6.3. While the document is good news to owners of phones mentioned in the list, it was a disappointment to owners of the international variant of Galaxy S3 (GT-I9300) since it will not receive the update due to "unresolved problems." A tipped screenshot, however, showed that the reason why the company cancelled the update for the device is because the TouchWiz UI, which is the built-in launcher for Samsung flagship phones, prevented system apps to be loaded during system initialization. It was clear, though, that RAM isn't the issue why the device isn't getting the 4.4 KK, contrary to speculations we've heard from other tech enthusiasts. If you have one of the devices mentioned, you may want to check out the picture attached to this post for the ETA of the update.